Penelope Burk literally wrote the book on Donor Centered Fundraising in 2003. So, the idea of donor-centricity isn't new. What's donor-centricity, you ask? It's organizing everything you do around the wants and needs of your donor. And in nonprofit communications, there's nothing more important than making the message about your donor. 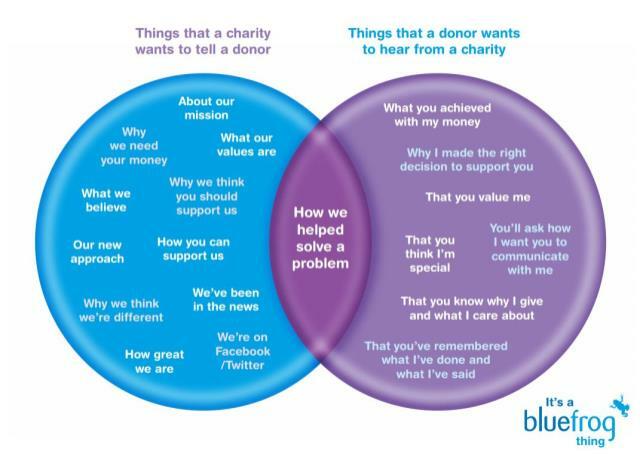 So, how should you be talking to your donors? Nonprofit communications experts (like Tom Ahern, Jeff Brooks and Kivi Leroux Miller) have long touted the virtues of donor-centric communications. Everything you write  from your website to your newsletter, from your fundraising appeals to your thank you letters  it should be written for and about your donor. Yes, you want to tell stories about all the good work you're doing. But remember, it's your donors who make all of your work possible. If you're not sure if your communications are donor-centric, take Tom Ahern's "You" test. Grab a green pen, a red pen, and the last thing you wrote. Every time you wrote "you" or some variation ("your," "you'll") or the donor's name, circle it in green. Every time you wrote your organization's name or "we," circle it in red. You want to see at least a 2:1 ratio, green to red. Okay, so now you know you should talk more about the donor in your nonprofit communications and less about your organization. However, there's a new and growing trend in nonprofit communications that makes it okay to say "we," as in "We're in this together." 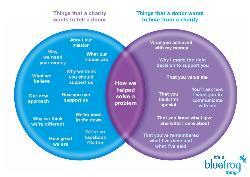 Look at this infographic that compares what nonprofits want to tell donors and what donors want to hear. That intersection? That's community-centricity. [Organization-centric] Our food bank campaign is underway, and we need your support. [Donor-centric] Your monthly gift ensures that the food pantry shelves are never empty. [Community-centric] Together, we can make sure none of our neighbors are hungry. Do you hear the difference? Which version or versions do you think your donors would respond to? Donor-centricity will help you attract new donors. It will help you keep your existing donors. And in the end, it's just good business. Are you ready to take the "donor-centric" pledge? This is a 23-point statement, which was created by Tom Ahern and Simone Joyaux for their book, Keep Your Donors: The Guide to Better Communications and Stronger Relationships. Take the pledge, then follow through and keep your promise. You can do it. And your donors deserve it. Do your nonprofit communications pass the donor-centered test? Check your last appeal, thank you letter, even your newsletter against this donor-centered checklist. Then check out these other resources to make sure your donor is at the heart of your communications. Use these 5 tips to write donor-centered fundraising appeals. Click here. Follow these 3 simple steps and you'll be writing donor-centered thank you letters in a snap. Click here. Here are 6 things that you'll want to do in a donor-centered newsletter (and 3 things you don't!). Click here.